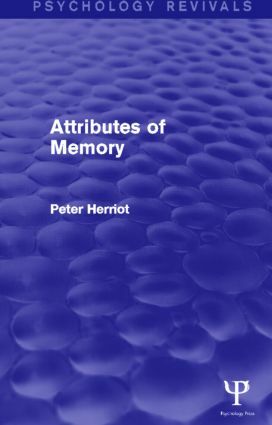 First published in 1974 Attributes of Memory rejected the prevalent stress on the structure of memory. It suggests that the view of memory as a sequence of stores through which information passes is mistaken. Instead, the author emphasizes the coding process of memory by which the nominal stimulus, the stimulus as presented, is transformed into the functional stimulus, the stimulus as coded. Dr Herriot proposes that there are many different forms of coding, and that efficiency of recall or recognition performance is a function of the nature of coding employed. He suggests that the subject’s linguistic system is the most frequently employed linguistic device; that is, that the underlying attributes and rules of language are used automatically when material is verbal. Since the basic function of language is to communicate meaning, those forms of coding which are meaningful in nature are most effective in memory. The book cites a great deal of experimental evidence, including many studies of the time. As well as stating a point of view, it should be useful to undergraduate and postgraduate students as a review of the early literature, read in its historical context.